welcome at Luxe Pack Monaco 2013. SoFT TOUcH - Original or CopyAs previously reported in an article on the 18th Oct entitled,” Derprosa To Make Its Mark At Luxe Pack Monaco 2013”, the company said it would offer a surprise at the event with a visit related to its SoFT TOUcH films. Well it did in the shape of a look alike of the Formula 1 driver Fernando Alonso who appeared with the slogan ‘Original or Copy?’ Dressed in the company’s colours, he gave out invitations to people attending the event. Derprosa said the idea behind this marketing ploy was designed to emphasize the fact that SoFT TOUcH is a unique product, created and developed by its R&D Department. The slogan used was to make it clear that some other films were are an attempt to imitate Derprosa’s levels of finish and texture, and are just copies, without the value of the original. Derprosa added that two features are worth highlighting about these new films: their capacity to act as backgrounds for printing and also their usability, since they are films that can be easily varnished, printed, glued and stamped regardless of the type of material they are applied to. In the case of the ELEGANCE range, Derprosa pointed out that the possibility exists of adding varnishes or stampings or even gluing them, after they have been laminated. On the company’s stand, as well as these new films, it also exhibited a full range of other brands which it offers the luxury packaging market. These included a Metallized range, films with metallic colours that do not require the use of metallic inks and the SoFT TOUcH film with its silky finish. 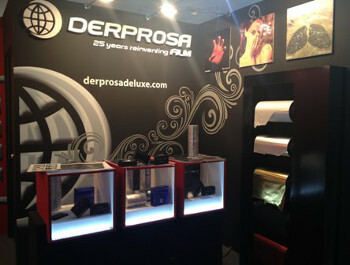 To ensure that visitors understood the value that Derprosa films can add to packaging, not only were the films themselves shown: applications of them on different packagings were also exhibited. This meant that those present could see the films and also the results of their application. The applications displayed included a variety of products to demonstrate the type of finish that Derprosa’s films give to folding cartons, cases and rigid boxes. With the success of Luxe Pack Monaco 2013 for Derprosa’s films at this trade fair, the company is continuing to strengthen its presence among the top levels of the cosmetics, perfumery, jewellery and gourmet gastronomy industries, internationally. My Top 10 Formula 1 Cars Of All Time. Motorsport – what I like about it.